Each TPP board carries 8 LEDs. These are our standard green and red status LEDs. See Status LEDs. on how this LED works. 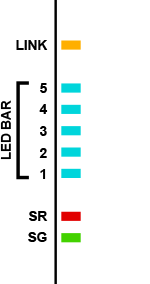 The TPP2 has a single Ethernet status LEDs -- the yellow "link" LED. See Status LEDs. on how this LED works.